Our group of icefishing warriors met up yet again this Saturday to fish on Lake Simcoe. Our group consisted of Evan and his friend Aydin, my buddy Matt, his dad and Matt's buddy Bobby, and finally Michael and I. We arrived at our access at different times. Evan got there first and advise us to park on the road since the usual parking lot has not been plowed. Michael, having some faith on his 4Runner, decided to challenge the parking lot instead. I advised him to simply park on the road, but Michael was willing to tempt fate. As we drove 40 feet into the lot, we were already having trouble going any further in. The tires were spinning and slipping, digging us deeper into the 12" snow. Underneath all this snow was gravel frozen in ice. At the end, Michael decided to park the truck off the side and we'll deal with it at the end of the fishing day. Once we got our gear together, we had a 1km trek ahead in knee high snow. The lake were littered with snow drifts, making our trek even more difficult pulling the 40lb sled fill with our gear up and down these drifts. When we set up camp, the heavy snow caused the ice to sink, forcing water up the holes. We had about 3 inches of water on the ice all day. For some reason, my Clam Expedition shelter was giving me trouble today and it didn't want to unfold and pop up properly. It took a good 20 minutes to finally get it set up. But once we're settled, we started to see some fish on the sonar. Just like last week, the fish were not too active for us in the morning. Meanwhile, Evan and Aiden, who were just 50 feet away from us, were having a great time with some aggressive lake trout that chased their lures up the water column. At around noon time, Aiden came by to see how I was doing. He suggested that Michael should join me in the shelter and we should fish in tandem using Michael's better sonar. Surely enough, Michael's sonar can detect more fish than my sonar can. We could see them, but they were still not willing to bite. It wasn't until around 2pm when Michael had a fish chased his X-Zone Swammer swimbait as he retrieved his lure from bottom up the water column. These swimbait has a ribbed body that is salt impregnated. I can also smell garlic so maybe it is garlic scented. Not very long after, we saw a few fish on bottom and I started to reel the Swammer up the water column. Although we couldn't see the lure on the sonar, a line came shooting up from the bottom. It was a lake trout chasing after the lure! The fish chased the lure up 40 feet off bottom and finally hit the lure. Maybe the fish only grabbed the tail of the swimbait. The weight of the fish was on the rod for a couple of seconds before the line came slack. Another few minutes later, another pack of lake trout came by. Michael and I were reeling up our lures when I was slammed! This time, the fish was hooked and the fish dove deep. Strangely, the fight was relatively short. We were both thinking this was a smaller lake trout until we saw some colour. It was a good size laker! Since the fish came up so quickly, it was still full of energy. Under the hole, the fish so what most lake trout loves to do - it spun in circles under the hole and rolled up in the line. We had to unwrap the fish several times before we got the head into the hole. It took both of us trying to get the fish out, since the slippery body had a girth wider than our grips. A couple of weeks ago, I landed my personal best lake trout at 26.5 inches. This was my new person best at 28 inches and 7lbs! Not too long later, I hooked another fish that came off. When the fish seems not interested to chase, Michael and I tried other lures to see if we could trigger them to bite with a different presentation. Some of the fish could be Lake Whitefish, since they have a habit of inspecting a lure that darted off bottom, but give up the chase a few feet off the bottom if the lure moves too quickly. Michael went back to the Swammer and finally had a fish slammed his lure about 50 feet off bottom. However, it must have grabbed the tail of the Swammer also since the fish came off quickly. We had an hour of watching fish chased our lures and got a few god hits. There were many, many close calls when the fish would chase up the water column about 30 feet but then gave up the chase. Finally, fishing then slowed down and we were trying slower presentations. I tied on a Rapala Jigging Rap and bounced it with the occasional 2 inch jig to work the lure right on bottom. One on jigging motion, I felt a little weight on the line and set the hook. Whitefish often hit very lightly (or they would hit and then take their food/lure upwards, making the hit feels very light or a sudden loss of line tension). The fish did not dog as much as lake trout usually does, so I was expecting a lake whitefish. However, the fish came up and it was a smaller lake trout. It was a stocked fish with a clipped pectoral fin. Fishing really slowed after this fish. We decided to pack it in by 4:30pm since we still have to get the truck out of the parking lot. By the time we put away our gear, we were losing light. Michael called CAA to find that they could not tow a stuck vehicle if it was stuck off the main roads. We had no choice but to get the truck up the hill on our own. Luckily, two guys who just came off the ice were willing to give us some help. Michael first had to turn the truck around. With the help of the two guys, we expertly rocked and rolled the truck multiple times and got it to turn the front of the car pointed upward toward the exit of the lot. This lot has a 10% grade at the top and a 15% grade toward the bottom. We have about 40 feet of 15% grade to climb. Since I cannot drive standard, it was Michael who had to work the car while we do the rest of pushing. Even with 3 guys at the back, the truck was having a hard time making its was up. The tires simply were not fit to climb up this hill. The two guys soon had to leave. It left Michael and I at this empty lot to get the truck out on our own. This hill was going to take prisoners, but I am too damned stubborn for it. We will get this truck out! In the past, my friend Kazu and I were stuck 3k into a snowmobile trail when his truck slipped off the trail into the ditch, encasing the truck into a foot of snow under the truck. If we could get his truck out of that, we could get Michael's 4Runner out of this lot. Instead of digging out a path for the truck, I packed more snow under the tires. The point is to put some snow under the tired to give it some traction. The truck did not move up easily. If you give the truck too much speed, the tires would spin too fast and worn down the snow even more. We had to back the truck just a few inches, then give it some gas and rock it up the packed snow we shoveled under the tires. As soon as we rocked the truck up the snow pile, we had to put on the brakes to prevent the truck from rolling back. Most of the time, the truck could not move forward any further since it would sink again into unpacked snow and the tires would spin. Our progress was measured by inches. Bit by bit, we rocked the truck up the slope. About an hour later, we finally moved the truck 40 feet onto the 10% grade slope. Here's a look at our progress. From the sign to the very far back corner that you could just make out, it was about 30 feet. Our tire marks on the right side was coming out of the snow bank. On the left side was a patch of ice. You could make out our tire tracks and the packs of snow that we rolled up and over slowly before the tires sunk back into another patch of soft snow. At the upper end, the snow on the lot was packed by other vehicles that had used the lot. But those other vehicles had also spin their tires in this area. Although it was only 10% grade, the 4Runner couldn't make it up the slope with the many icy patches along the way. Michael called CAA again since we were just 40 feet from the main road. He asked them to bring some sand and traction pads to see if they can help us out. While we wait for CAA to arrive, we looked at the trees around us and thought "We could use branches to add traction under the tires." Lucikly, we had some cedar trees around us. They were prefect since the cedar branches and leaves "should" give us enough traction under the tires if we plan this out perfectly. 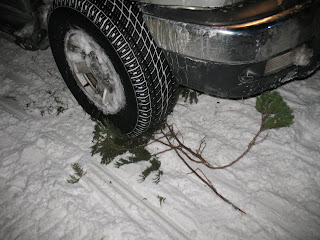 We shoved the thicker end of the branches under the tires such that the wider spread of smaller branched and leaves would spread across the snow, adding wider area of traction as the tires rolled forward. Our first attempt was surprisingly successful. Instead of a gain of inches, we actually rolled up the hill 3 feet! We reset the branches again and our next try was even better. This time, we rolled even further up and the back tire successfully landed on the branches that were placed under the front tires. We managed to moved the truck about 15 feet up the hill before CAA arrived. The driver told us we were still too far away for this winch cable to reach us, but he was impressed by our method and our progress. He said he could help us push the truck up on the next go. We reset the branches and this time, we had two people (and a bigger person than I) pushing from the back. Maybe it was the extra push, or maybe we finally got the truck back onto a more reasonable grade, but one good push and an encouraging feeling to traction had the truck continued to drive forward up the hill to the point we didn't even need to push anymore. Michael kept driving...10 feet, 20 feet...and we were finally out of the parking lot!!! We thanked the CAA guy and he made his way to the next call. Michael and I hooted and hollered like we've just won the lottery! I walked back to take a picture of our last stuck location. This may not be as desperate as some of my past icefishing adventures, but our victory was definitely one that I'll be telling for a long time.